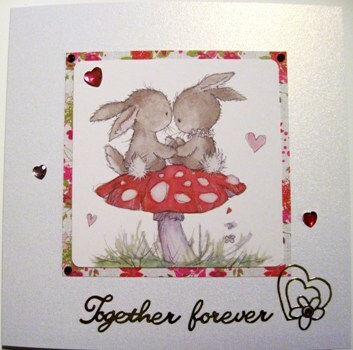 Cutest handmade pearl white card 144mm sq with picture of two bunnies sitting on a toadstool, matted onto pink floral paper. 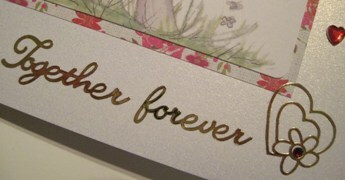 Underneath are the words 'Together Forever' in gold, with 2 gold heart outlines, embellished with coloured heart and round gems. There is room for a short message or name at the top. Please use the Personalise form. The inside is blank, but we are happy to include a printed insert if you prefer. 10% of the purchase price of this card is donated to Dogs for the Disabled charity.